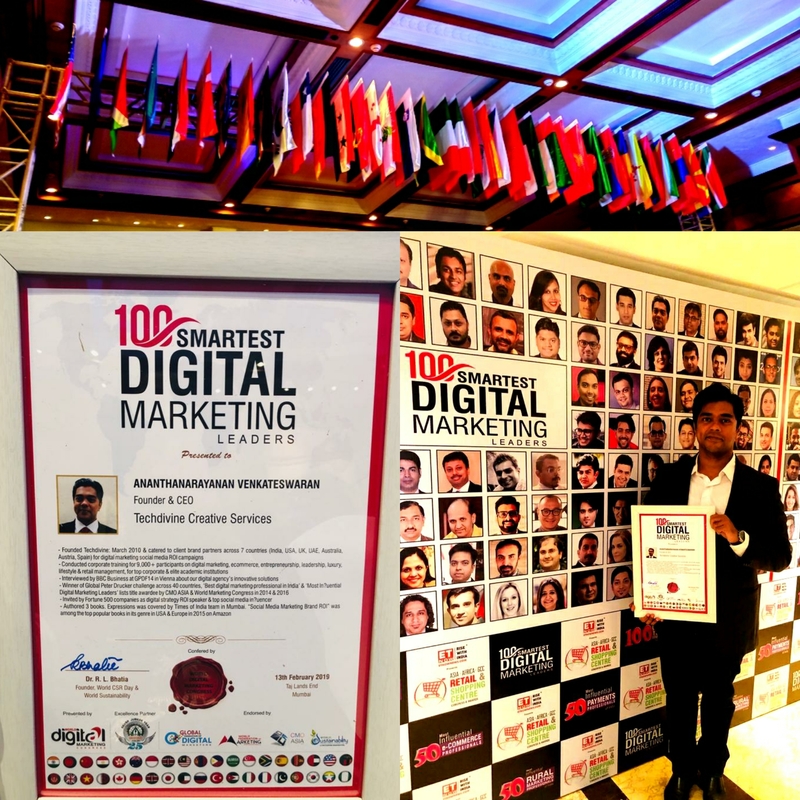 On February 13th 2019, at Taj Lands End, I was awarded by CMO ASIA and World Marketing Congress the title of “100 Smartest Digital Marketing Leaders“. The list features some of the brightest minds in the digital marketing industry. 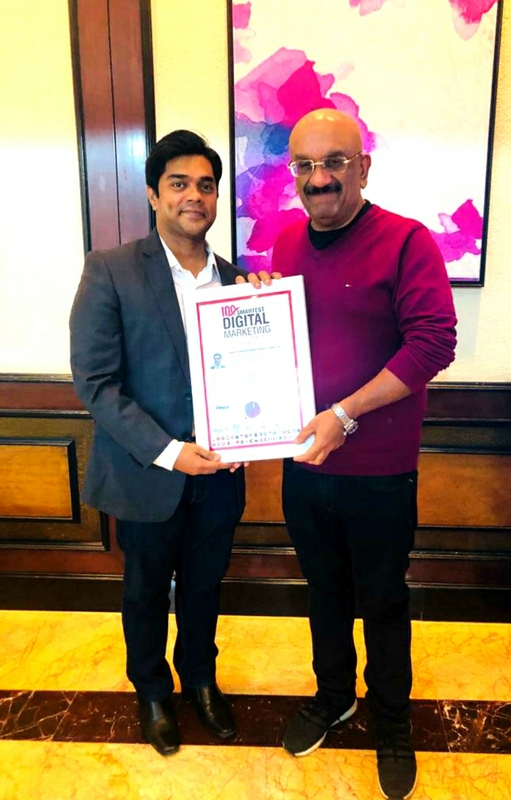 The “100 SMARTEST DIGITAL MARKETING LEADERS” for 2019 was arrived at after going through a detailed analysis of digital marketing professionals and with respect to their contribution towards making the digital world a better place for businesses. The brands that are a part of the event and awards are some of the most reputed brands in the field of digital marketing and branding today across the globe. 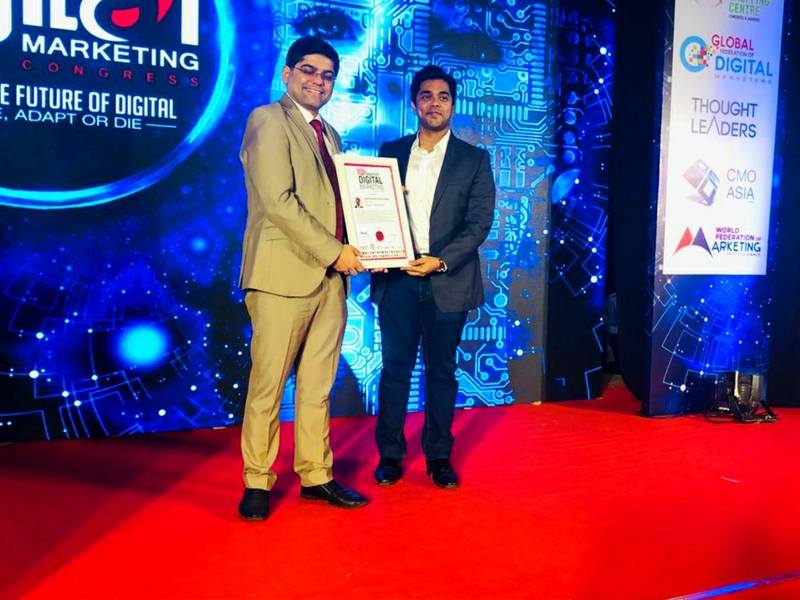 The Digital Marketers’ Awards are designed to recognize exceptional work done by the Marketing fraternity to take their brands into the digital era. Brand Stewards i.e. the CMOs or the Heads of Marketing shepherd their teams and their company into creating brand assets. These awards will recognize & reward leaders for the pioneering job of online asset creation amongst their peer-set for their brands. The entries will be judged by an exceptional jury who will not only look at results but also the leadership ability in creating an innovative marketing environment that has the ability to change the game of the branding and marketing industry. This month marks an important milestone for me as an entrepreneur as I near 9th year of my entrepreneurship with Techdivine Creative Services which was Founded by me in March 2010 as a digital marketing social media agency in Mumbai. As of date, we have catered to 70+ client brand partners across 7 countries (India, USA, UK, UAE, Austria, Australia, Spain) delivering digital marketing social media ROI solutions across industries, have won 5 global recognitions and awards and have also conducted corporate training, employee engagement, employee development programs for 9,000+ participants across some of the top corporate, Fortune 500 companies and elite academic institutions across the globe. To me, awards are more than a name, brand or a wish list. It means ensuring that I keep learning in my field of work and tirelessly dedicate towards delivering better work for exceptional clients with core focus towards management, ethics, delivering real value to brands and end customers through this journey. I sincerely thank all our client brand partners, peers, family and friends, without all of your trust, support, blessings and grace, none of this would have been possible. THANK YOU.